Join the Cambridge Writers’ Workshop on our summer writing retreat to the cultural oasis of Granada, Spain. Located at the foot of the Sierra Nevada mountains in Andalucía, Granada is one of the gems of Spain and has inspired writers from Washington Irving to Salman Rushdie to Ali Smith. Let the old city stimulate your writing with its winding streets, Moorish history, and evocative landscapes. Work on your existing manuscript, or look to the beauty and warmth of Granada to inspire all-new projects. 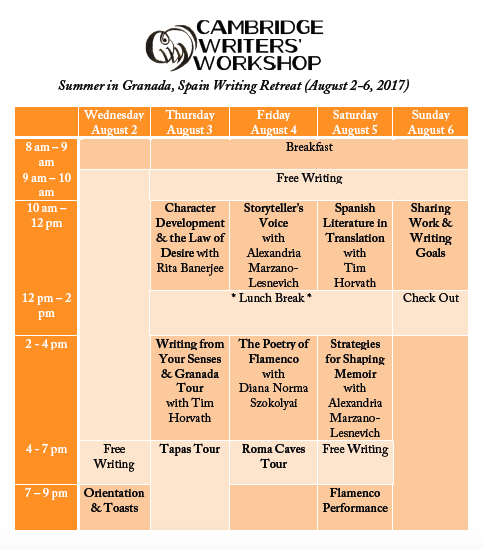 The Cambridge Writers’ Workshop Summer in Granada Writing Retreat will take place from August 2-6, 2017. During the retreat, we will be staying at the Hotel Guadalupe, just a short walk from the Alhambra. The retreat offers multi-genre workshops, as well as craft seminars and time to write. 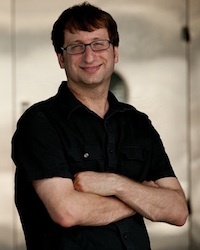 The faculty includes award-winning writers Tim Horvath, Alexandria Marzano-Lesnevich, Rita Banerjee, and Diana Norma Szokolyai. Genres include fiction, nonfiction, and poetry. The cost of the retreat is $2950, which includes tuition, lodging, and daily breakfast. Due to limited seats, early applications are encouraged. Applications due June 20, 2017 at cww.submittable.com. Rita Banerjee is the Executive Creative Director of the Cambridge Writers’ Workshop and teaches at Rutgers University. She received her doctorate in Comparative Literature from Harvard and her MFA in Creative Writing from the University of Washington, and her writing appears in Poets & Writers, The Rumpus, Painted Bride Quarterly, Mass Poetry, Hyphen Magazine, Los Angeles Review of Books, Electric Literature, VIDA: Women in Literary Arts, AWP WC&C Quarterly, Queen Mob’s Tea House, Riot Grrrl Magazine, The Fiction Project, Objet d’Art, KBOO Radio’s APA Compass, and elsewhere. Her first collection of poems, Cracklers at Night (Finishing Line Press), received First Honorable Mention for Best Poetry Book of 2011-2012 at the Los Angeles Book Festival, and her novella, A Night with Kali, in Approaching Footsteps (Spider Road Press), released in November 2016. Her edited volume, CREDO: An Anthology of Manifestos and Sourcebook for Creative Writing, will be released by C&R Press on March 7, 2018. She is currently working on a novel, a book on South Asian literary modernisms, and a collection of lyric essays. Once you are accepted into the program, you will need to pay a 30% tuition deposit to hold your seat within 3-5 days of acceptance. This amount is non-refundable. The remainder of tuition will be due by June 1, 2017. Our standard and preferred method of payment is PayPal invoice. You can also mail us a check. The deposit is non-refundable.